By booking now on Jin Jiang website, you will get a 10% discount. Jinjiang Metropolo Hotel Hefei Baohe officially joined the Jinjiang Metropolo Hotel in June 2014, becoming one of the first mid-and-high-end light art hotels of Jinjiang International Group. 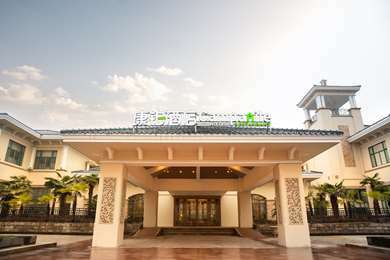 The Hotel is located within first ring road of Hefei. Boasting superior geographical location, the Hotel adjoins Anshan Road in the west and Chaohu Road in the east, with Wuhu Road passing through the plot; many bus lines, such as Bus Line 6, 137, 145, 159, 154 and 226, etc., provides access to the Hotel, and the Hotel receive nearly 100 thousand people every year. In cooperation with Dalian Wanda famous nationwide, the Hotel is located in Wanda Plaza, Baohe District, Hefei. The project of Baohe Wanda Plaza has about 180,000 square meters large international shopping center, where catering, accommodation, shopping and entertainment needs can be fully satisfied. At the northwest of the Hotel, there is the national 4A scenic spot Baohe Park. By walking for 5 minutes, you can enter into the gardens, enjoying the relaxation of keeping quiet in a noisy neighborhood. The Hotel's lobby has decorations being concentrated essence, wall made of black bricks with ancient charm, and conic droplights of elegance beauty, making you feel simple and exquisite once you enter the Hotel. The small corner for meeting guests will not forget your loneliness of waiting, so the free Wi-Fi high-speed network access and the free computer are provided for you so that you can enjoy surfing on the Internet at any time. The Hotel decoration was conducted according to the four-star standards. A total of 134 guest rooms with refined decoration can meet the accommodation needs of all business and travel guests. After the tiring journey, you are provided with TOTO bathing articles by the Hotel so as to fully relax yourself. By lying on the comfortable and large bed and closing your eyes slowly, you can sleep very well during the whole night. After you waking up in the morning, the delicious and nutritious breakfast has been prepared for you at the restaurant on 2nd floor, waiting for your taste. Jinjiang Metropolo Hotel is your life aesthetician, and every party of live is featured by aesthetics.